UPDATE (5/17/12) – And here are the colors! Thanks for the patience! All is well. A quick heads up before today’s prose. Caroline’s been extremely sick for a week and it ate up our buffer, so rather than give you no comic at all, here are the inks for the page. Colors are coming, and we’ll update this the second they’re done. The good news is that after this page, we’re gaining a three page buffer due to some working ahead we did for a convention earlier in the year. So all should be well next week! 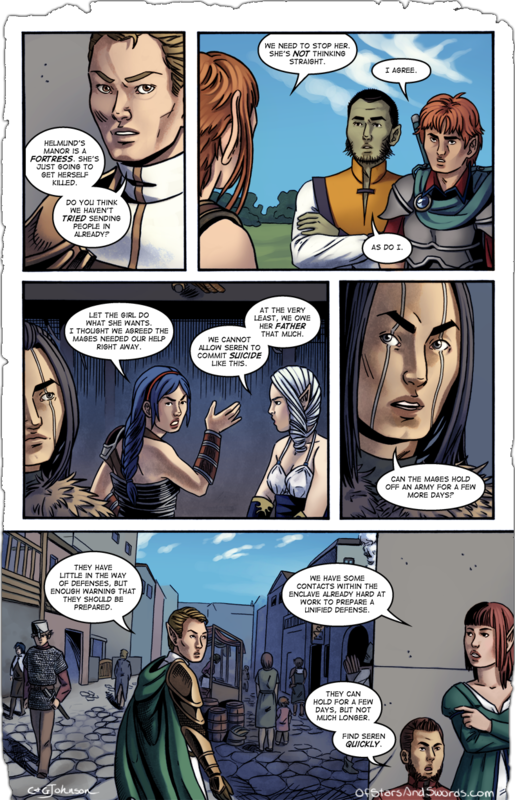 “I would like to make it known that I am opposed to this,” Kyros repeated for at least the fifth time. No one was listening to him anymore, and his need to be the center of attention was conflicting with the fact that it might just get him killed. Cato, Kyros, and the woman, Anica, were in a small building on the third level of Oriona. It was night, but that had little effect on the light in the city. The towering marble structures blocked out most natural sunlight as it were, so the torchlight that now dominated the city wasn’t all that different off in the stretches of the streets that weren’t open to the sky. Across from the small, empty warehouse they had occupied for the last hour, was their ultimate destination: the small temple that Kyros had gotten into earlier that day and the very act that had resulted in…well, in all the problems since. It was well lit, ominously set behind a group of large columns, and guarded by a half dozen armed soldiers. This was the root of the problem that Kyros was struggling with. It was clear something odd was going on within a special chamber in the temple, but no one had ever come out, save for Kyros, and he’d been running for his life at the time. That meant Kyros was going to be the first one in, as he could lead them directly to the chamber’s entrance, as long as it hadn’t been altered in some way. But they had agreed that it was best not to worry about any strange magic, as planning for that would be impossible. A sudden, bright flash illuminated the entire street. A few shocked cries followed, but the noise that Cato locked onto was a distinct, but well hidden, thud. When his eyes had adjusted, one of the soldiers was on the ground, blood pouring from a cut in his throat. Pel was already in the process of throwing another of the soldiers off a nearby ledge to the ground, two levels below. She worked fast. The guards recovered from the blinding flash moments after Cato’s eyes had readjusted, drawing their swords unsteadily as they moved for Pel. The Elf, though, did not continue the fight. She laughed, spun around, and bolted down the street. Two of the men went after her, pushing through the shocked pedestrians that were still recovering. Soon, Pel and her pursuers were out of sight, but that still left two well-armed and very alert soldiers in front of the temple. Cato glanced from his brother to Anica. The woman raised a hand wordlessly, telling him to be patient, then pointed to the scene again. The moment that Cato’s eyes turned back, a wall of a man came barreling out from a side street near by. It was Rollan, and he had a club in his hands the size of Cato’s torso. The remaining soldiers heard him coming — really it was hard not to — and turned, swords drawn, to stop him. Never before had Cato seen a man send two others flying with one blow. The two soldiers, fully armored, went over the nearby ledge as if they were made of straw. Rollan let out a gruff noise and then motioned in their direction. “There’s our signal,” Anica said quietly as she led the way out of the building and across the street, a small sword in hand. His brother nodded and took the lead, removing a dagger from his belt as he reached the temple’s front door. It was a thick, iron slab covered in typical religious markings: a sun, worshipers, floating eyes, and other generic symbols. There was a handle, but, interestingly enough, no lock. Temples never had locks on the front doors, yet always had things hidden within. Cato would never understand why anyone felt it was a good idea to not have sturdy locks on all the doors, rather than just the small, wooden ones that were easily kicked in. Thanks to poor design, though, Kyros pushed the door open to reveal more typical features of a temple. A small entrance hall, candle-lit and with some nice windows to let in light, if light ever got down here. There was a hall with chairs and benches ahead, but Kyros immediately turned left, following an uncomfortably narrow corridor that quickly ended at a winding stairwell. “There’s only two directions, you cannot be confused already,” Cato grumbled as his brother looked around. “What do you mean?” Anica was furthest back, trying to lean past Cato to see but having a lot of difficulty with that. “These are called stairs, brother,” in no mood for this, Cato attempted to motion at it with his own sword. There was a clang and his blade was stopped in what should have been open air. The sound eventually stopped echoing and the three looked between one another. Cato knew what it meant, and he hoped the others did, too. He hated magic. Magic was cheating and unfair when used against him, as it so often seemed to be. Both brothers felt it before they all heard it. The invisible door shifted slightly. Seconds later, the sound of metal scraping against stone came from in front of them and they watched the stairwell slide inwards as if it were a painting on the door itself…and a man in a crimson robe stood on the other end, hand on the door. The four individuals stared at one another for an awkward few moments.